Thank you so much Joy, you are so inspiring and your story telling is what made me want to do this, it was so inviting and showed me how to finally have a blog and enjoy doing it. And here it is...my first recipe post, my baby, my Southern Style Strawberry Cake. Many thanks to Joy The Baker for the recipe, and more than that, for inspiration to do this! It was fun, the cooking part, but even more taking the photos! Cooking and Photography!??!? Could something be more fun? I did change the original recipe just a bit, I thought the cream cheese frosting was a bit to sweet...I think almost any frosting is too sweet though! 1/2 cup fresh strawberries, finely diced. To make the cake, combine to cake mix, Jello, flour and sugar in a large bowl. Mix well. Add the oil. Add the eggs one at a time, beating well after each addition Add the water and strawberries and mix well. Divide the batter evenly into three 8-inch or two 10-inch round baking pans that have been oiled and floured. Bake for 25-35 minutes, or until a tooth pick inserted into the center of the cakes comes out clean and the layers pull away from the sides of the pan. Transfer the layers from the oven to wire racks. Let them cool, still in their pans, for 10 minutes. After 10 minutes, run a knife around the inside edge of each pan, then unmold each layer onto the racks to cool completely. To make the frosting, in a bowl combine the cream cheese and butter. Beat until soft and pliable and no lumps remain. Add the powdered sugar, salt and vanilla extract. Beat until incorporated. If you would like a thicker consistency, add a bit more powdered sugar until the desired consistency is achieved. Put the coconut in a small bowl and sprinkle with two or three drops of pink die. Mix with hands to distribute the color and wash hands immediately. 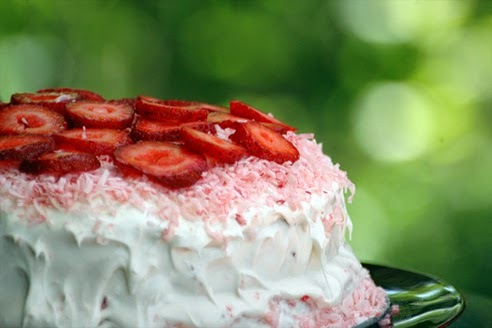 Once the cake is frosted, decorate the top of the cake with the shredded coconut and sliced strawberries.